Historic New England presents its annual Program in New England Studies (PINES), an intensive week-long exploration of New England from Monday, June 15 to Saturday, June 20, 2015. PINES includes lectures by noted curators and architectural historians, workshops, behind-the-scenes tours, and special access to historic house museums and collections. The program offers a broad approach to teaching the history of New England culture through artifacts and architecture in a way that no other museum or historic site in the Northeast can match. It’s like the Attingham Summer School as a week in New England. 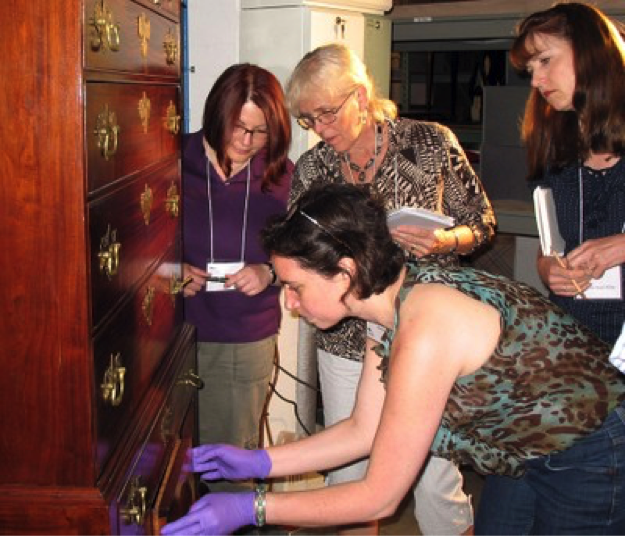 Examine New England history and material culture from the seventeenth century through the Colonial Revival with some of the country’s leading experts in regional architecture and decorative arts. Curators lecture on furniture, textiles, ceramics, and art, with information on history, craftsmanship, and changing methods of production. Architectural historians explore architecture starting with the seventeenth-century Massachusetts Bay style through the Federal and Georgian eras, to Gothic Revival and the Colonial Revival. Travel throughout New England for tours and receptions at historic properties in Greater Boston; Essex County, Massachusetts; Portsmouth, New Hampshire; South Berwick, Maine; and Woodstock, Connecticut, including the Boardman House (1692),Codman Estate (1740), Jeremiah Lee Mansion (1768), and Roseland Cottage (1846). Participate in workshops and spend time with curators examining items from Historic New England’s wide-ranging collection; visit private homes and collections; learn about a groundbreaking approach to interpreting eighteenth- and nineteenth-century domestic life at the Dennis Severs House in London; and enjoy a champagne reception on the terrace of Beauport, the Sleeper-McCann House (1907), on Gloucester Harbor. The program is a chance to meet people from all over the country who want to learn more about New England and to hear from the connoisseurs who want to share information about their area of expertise. The $1,550 fee includes all lectures, admissions, guided tours, transportation to and from special visits and excursions, daily breakfast and lunch, scheduled evening receptions, and various service charges. Scholarships are available to mid-career museum professionals and graduate students in the fields of architecture, decorative arts, material culture, or public history. Candidates from diverse cultural backgrounds are encouraged to apply. To register or for more information, visit PINES on the Historic New England web site or contact Ken Turino at kturino@historicnewengland.org. This entry was posted in Collections, Historic preservation, Historical interpretation, Training and tagged Historic New England, Ken Turino, Massachusetts on March 25, 2015 by Max van Balgooy.